I could have all sorts of excuses for why it’s been 3 weeks since I’ve posted a recipe. Let’s just skip all the talk about the cute new kitten in my life (Stripus Maximus) and the week in Arizona (heaven) and the weekend of cross country skiing (also heaven). Forget I mentioned that. Let’s just skip right to the good stuff. Because after 4 weeks of no sugar, dessert is back in my life. On a limited basis anyway. It’s all about balance. Peanut butter fudge was one of my favorite confections growing up. It always seemed less tooth-achingly sweet than the chocolate kind. More earthy. Even, dare I say it, a wee bit healthier. But, these peanut butter fudge cookies take the best of peanut butter fudge – that gooey, dense deliciousness – and bring it to a cookie. Best of all, they’re date-sweetened. Yep. No refined sugar. The chocolate chips are just a bonus. Let’s not quibble about those. In the bowl of a food processor, pulse the dates until they are finely chopped. Add the peanut butter, flax seed, almond milk and vanilla. Process until creamy, scraping the sides occasionally. Add the baking soda and almond flour. Pulse until mixture forms a ball. The dough will be very sticky. Remove from food processor and stir in chocolate chips (if using). Drop by tablespoons onto prepared pans. Dipping a fork in water, press criss-cross markings into top of each cookie. Bake for approximately 10 minutes, until beginning to brown on edges. These cookies will not be crisp. They hold together nicely and have a soft, fudge-like texture. For more slightly indulgent options, try Slightly Indulgent Tuesdays. 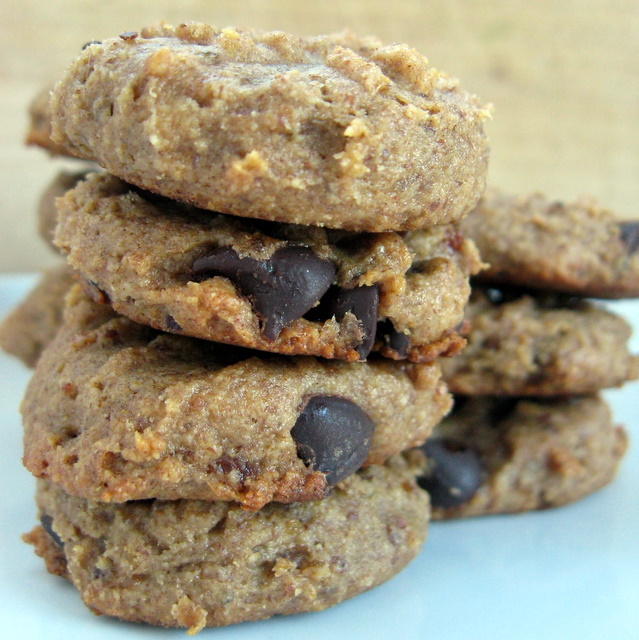 This entry was posted in cookies, dates, desserts, flax seed, grain-free, nuts, peanut butter, vegan. Bookmark the permalink. These look amazing – I will definitely be trying to make these tomorrow! Oh myyy… these look delicious! I always liked peanut butter fudge better too! oh nice! I love that these are sweetened with dates. I’ll have to try these! I love peanut butter, chocolate and dates, but have never thought about combining them. Genius! Thank you! I will be making these this weekend! YUM! Vanessa – not a dumb question at all. There are typically two types of almond flour – the blanched kind (which does not contain any skins) and the un-blanched kind (which is usually more akin to almond meal). There’s a faction of people that swear by Honeyville Farms blanched almond flour and will only use that in baking. I belong to a separate camp – the one that uses almond flour and almond meal fairly interchangeably. I did recently buy some Honeyville flour, and that’s what I used in this recipe. But, past experience would tell me that you could just as easily use Trader Joe’s almond meal/flour and it would work. Thanks so much, I’m in cast to my knee after having foot surgery, but will be making these as soon as I can stand on 2 feet again they look so yummy!! Yummmmmm. What a return after awhile away! You are welcome to take breaks whenever you like, as long as they are followed by fudge cookies 😉 I am always on the lookout for on-sale dates, snatching some and making these as soon as I can! Just discovered via pinterest – sounds wonderful, can’t wait to try! Neat! It’s always fun to know how people find my recipes. Yum!!!!!!! I made these this morning and they are so soft and delicious. Something I really like about many of your dessert type recipes is that they have such great ingredients in them that I don’t feel bad letting my kids eat the final product as a main course for breakfast or lunch. I let them have your Banana Brownies for lunch all the time. Thanks for another great recipe! Wow – thanks for such a rave review. I’m so glad to hear that you make my recipes and that your kids like them. Yep, I too feel much better about letting my kiddo eat my cookies than the white sugar/white flour/no fiber stuff. And, I definitely feel the difference when I do eat white sugar (not that I ever eat white flour). These cookies don’t spike my blood sugar much at all. I’ve already had to make these again last night. We all love them so much we can’t keep our hands out of the container! My son ate these for breakfast this morning. I may just start making them regularly (sometimes with chocolate chips and other times without) to have on-hand for breakfast myself, instead of my usual processed protein bar. Thanks again! Yay! I LOVE hearing that Pam. 🙂 I bet they’d also be good with some chopped peanuts or even raisins – just to switch things up sometimes. Um, WOW. These look ridiculously amazing. (For lack of a better word-) So fudgy! Thank you! I’ve been surprised how much people have been liking this recipe. It seemed so simple. But, I guess simple can be good, eh? Those cookies look very tasty! Very tasty indeed!